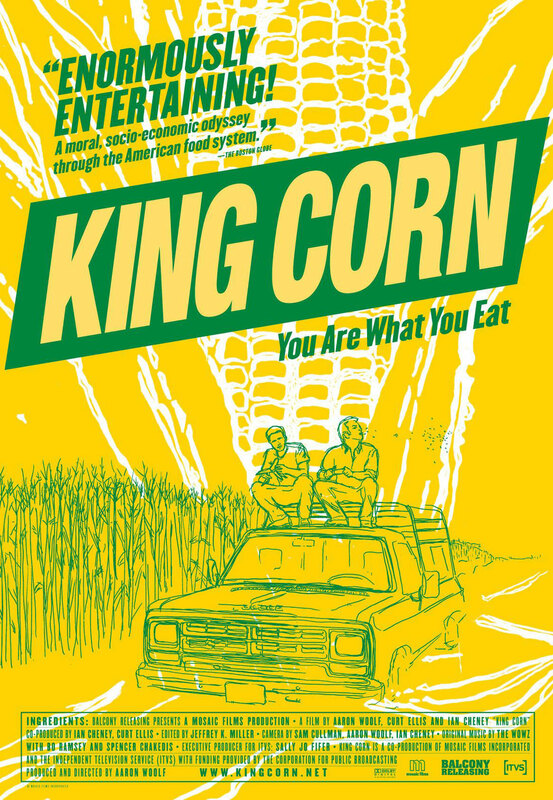 We finally watched King Corn the other night….a documentary I’ve been meaning to see for a while. What is this recent obsession I have with food and environment documentaries?! Anyway, the movie follows the journey of two guys (Ian & Curt) as they set off across the country to Iowa where they plant an acre of corn and attempt to track its life. The friends actually had ancestors from the same small town of Green, Iowa. So that’s where they went to found a farmer who would let them rent an acre to grown their corn on. They start off by describing how the country evolved from corn on the cob to commodity crop. Earl Butz was appointed Secretary of Agriculture under the Nixon administration and under his advisement small family farms were encouraged to grow as much corn as possible. This is contrary to the previous philosophy of keeping production low to keep demand high. SO, then we started growing more corn than we ever had before. And as you might expect prices went down. So what did our government do? We decided to subsidize the crop and now a portion our tax dollars still goes toward paying farmers for supplying us with a surplus of inedible product. One of the guys comments on the thousands of acres of corn surrounding him and that none of its edible because it has to be processed first. Michael Pollan (who makes an appearance in the movie with a rather whimsical comb over) talks about the irony that an Iowa farmer can no longer feed himself. In the end Ian and Curt’s acre grew 10,000 pounds of corn – 32% to be exported or become ethanol, 490 pounds to become sweeteners, and half of the crop to be fed to animals like cattle and other animals who have not evolved to do so. Towards the end of the movie, and in a somewhat Laurel and Hardy-esqe fashion, the duo attempt to make high fructose corn syrup at home. The recipe was so difficult they consulted a chemist and took copious notes. They wore masks while making it and several ingredients had the typical skull and cross-bones toxic warning on them. But our FDA says these ingredients are totally fine to consume. No biggie. Overall, this film is worth a look for its creativity and thoughtfulness. Enjoy! Entry filed under: Movies. Tags: King Corn.